Boy vs. 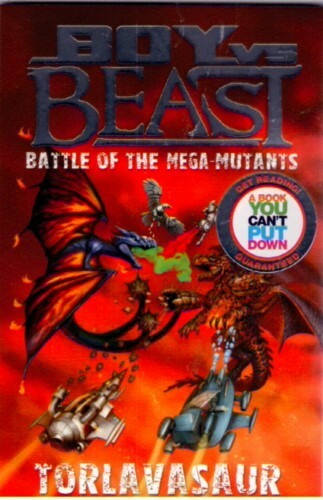 Beast – Battle of the Mega-Mutants. Torlavasaur. This science fiction drama continues to follow the battle between beast and man in different territories, between Beastium and Earth the battles rage on. Captain Kai Masters must defend the border which divides the two. Can he do it yet again? Robohawks poo and the making of a bomb is a chuckling chapter. No doubt children of all ages will love this part! This battle could have consequences for Earth that could be deadly as Torlavasauraq has toxic breath and if breathed on Flamatoraoadon will make it grow to a gigantic size. Captain Kai Masters has his work cut out for him but it is his job to defend the border no matter what. This book like the rest is full of adventure, humour and good old-fashioned fighting. The book has large easy print for children to read and pictures along with Border Guard files. A good read!